Lovin' Lyrics Music Promotions: SISTER HAZEL LANDS ON BILLBOARD TOP COUNTRY ALBUMS CHART AGAIN! SISTER HAZEL LANDS ON BILLBOARD TOP COUNTRY ALBUMS CHART AGAIN! 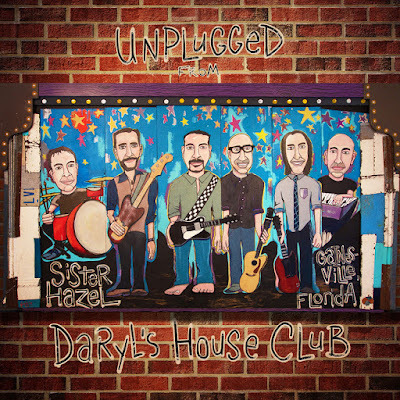 In their second showing on the country music charts this year, platinum-selling band, Sister Hazel, makes another strong debut with the stunning 14-track live performance DVD, "Unplugged From Daryl’s House Club," which features their classic hits and new offerings for a one-of-a-kind intimate live experience. The album debuted at #75 on Billboard’s Top Country Albums chart. In February, Sister Hazel debuted “Lighter In The Dark” at #4 on Billboard’s Top Country Albums chart, #6 on Billboard’s Independent Albums chart, #30 on Billboard's Top Current Albums chart and #79 on the Billboard 200 album chart. First week sales of the new CD were 8,352 units. Commenting on this year's success of two Billboard charting albums, Ken Block, Sister Hazel’s lead singer said, "It’s crazy exciting to us that we've had TWO new CD’s on the Billboard charts is less than a year! Huge thanks to all the Hazelnuts - And especially to all the new fans out there who are just now discovering Sister Hazel's music, live shows, and our signature events. We’re having a Blast!" For more information on Sister Hazel, visit their website at www.sisterhazel.com. Follow Sister Hazel on Twitter at @SisterHazelBand, on Instagram at sisterhazelband and on Facebook. .